CI-100A is high performance SelCall CCIR-decoder / encoder for EEA, EIA, ZVEI1, ZVEI2, ZVEI3,DZVEI, ZVEI GB, ZVEI F, ZVEI DP, EIA, CCIR, CCIR1, CCIRI, EEA, CCIT, EURO, VDEW, AUTO-A, PZVEI, NATEL or Motorola and other on request with time stamp and RS 232. It decode all in band tones 16 tones/codes including A, B, C, D E(R), F tones. It is based on the CML audio processor. Incomming audio signal is filtred in a digital filter before measure the frequency of the input signal in an audio processor. A telegram length can be from 5 and up to 16 chars long. Decoded telegram is displayed on the LCD with time stamp (year, month, day and time) it is also sent on the RS 232 serial interface including time stamp data. OEM component also available w/o a box, see below! 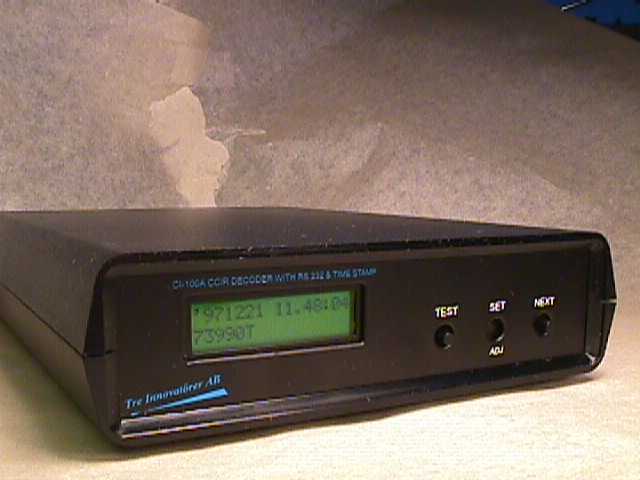 CCIR-decoder with RS-232 interface and Time Stamp. Support of all most all standards EEA, EIA, ZVEI1, ZVEI2, ZVEI3,DZVEI, ZVEI GB, ZVEI F, ZVEI DP, EIA, CCIR, CCIR1, CCIRI, EEA, CCIT, EURO, VDEW, AUTO-A, PZVEI, NATEL or Motorola. CCIR-decoder, a test instrument for CCIR-telegram up to 16 digits long telegram can be observe. Realtime clock with calender to year 2096. Test switch to easy a send test telegram on the serielport. Memory for the last CCIR telegram. Lithium battery for clock backup. 32 charters supertwist LCD display with LED backlight. Option: Encoder function (on request). New! CI-100 OEM for embedded products. A small PCB board size of 105 x 65mm. The "CI-100 OEM" an OEM component. Small size, easy to use and as the same high performance tone decoder, audio processor as the CI-100A. 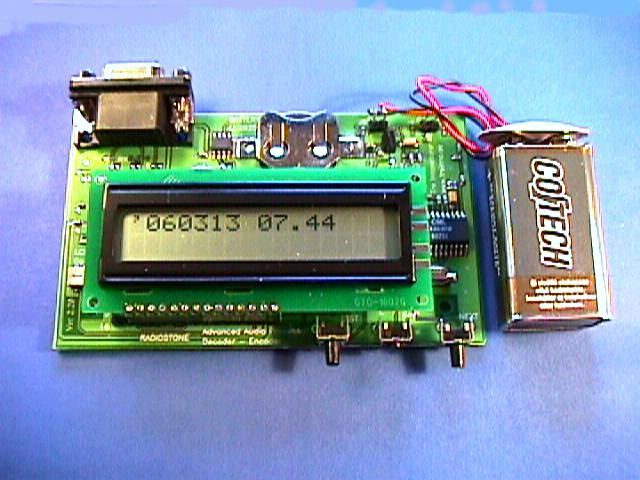 The LCD display is a piggy back and decoder can operate w/o the LCD. Remote option for all functions. True RS232 or CMOS levels. Easy to connect:. DC power to pin "OV" and "+", Audio input on pin "G" (ground) and "A". RS232 out on the female DSUB pin 2 and 5 (GND), no hand shake. 3 switches used to set the time stamp clock and to send a test message on RS232. Customs systems are also welcome, -We do them all! Memory: Last telegram memory with time stamp. Communication port: RS 232 19200bit/s 8N1 9 pol female DSUB. No handshake. Clock accurary: Better than +/-90 sek month. Backup battery (realtime clock) lithium CR2025. Model "CI-100A" with enclosure (cabinett) only on request. To easy test the RS232 communication between the CI-100A and a computer there is test switch on the frontpanel.When pressed a test telegram is sent. The CCIR decoder can easy connect to any PC-computer without any extra hardware or software. For all Windows use simple use the internal terminal (hyperterminal) can be used to logg CCIR telegram to the hardisk or to the VGA screen.